Windows combined with the scalability of the low-power ARM architecture, the market expertise of ARM silicon partners and the extensive SoC talent within the broad ARM ecosystem will enable innovative platforms to realize the future of computing, ultimately creating new market opportunities and delivering compelling products to consumers. Yep, it's a press release all right. Update: Want some more of that kind of language? Here's a whole second release full of it. Update 2: See that version 6.2.7867? It's what follows 6.1.7600, aka, Windows 7. LAS VEGAS - Jan. 5, 2011 - Microsoft Corp. today announced at 2011 International CES that the next version of Windows will support System on a Chip (SoC) architectures, including ARM-based systems from partners NVIDIA Corp., Qualcomm Inc. and Texas Instruments Inc. On the x86 architecture, Intel Corporation and AMD continue their work on low-power SoC designs that fully support Windows, including support for native x86 applications. SoC architectures will fuel significant innovation across the hardware spectrum when coupled with the depth and breadth of the Windows platform. At today's announcement, Microsoft demonstrated the next version of Windows running on new SoC platforms from Intel running on x86 architecture and from NVIDIA, Qualcomm and Texas Instruments on ARM architecture. The technology demonstration included Windows client support across a range of scenarios, such as hardware-accelerated graphics and media playback, hardware-accelerated Web browsing with the latest Microsoft Internet Explorer, USB device support, printing and other features customers have come to expect from their computing experience. 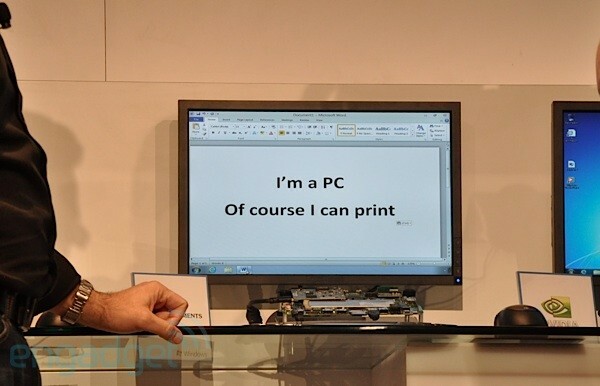 Microsoft Office running natively on ARM also was shown as a demonstration of the full depth and breadth of Windows platform capabilities on ARM architecture. Windows will continue its industry-leading support across the widest possible set of devices, delivering the breadth and choice that customers demand. Intel and AMD continue to evolve and improve the x86 platforms, including new low-power systems, and advance new designs such as the recently announced 2nd Generation Intel® Core™ processor family and AMD's Fusion accelerated processing units (APUs). NVIDIA, Qualcomm and Texas Instruments are joining Microsoft to provide ARM-based designs for the first time. "With today's announcement, we're showing the flexibility and resiliency of Windows through the power of software and a commitment to world-class engineering. We continue to evolve Windows to deliver the functionality customers demand across the widest variety of hardware platforms and form factors," said Steven Sinofsky, president of the Windows and Windows Live Division at Microsoft. SoC architectures consolidate the major components of a computing device onto a single package of silicon. This consolidation enables smaller, thinner devices while reducing the amount of power required for the device, increasing battery life and making possible always-on and always-connected functionality. With support of SoC in the next version of the Windows client, Microsoft is enabling industry partners to design and deliver the widest range of hardware ever. "We are entering a new era of computing where HD content and 3-D user interfaces are commonplace, from high-end gaming and content creation to video playback and Web browsing. Together, AMD and Microsoft enable these vivid and engaging PC experiences on x86-based devices, ranging from high-resolution, multidisplay desktops to ultrathin notebooks, netbooks and tablets, and we look forward to a new wave of innovation made possible by Windows and AMD Fusion APUs. Windows and AMD Fusion APUs bring to life outstanding Internet experiences, smooth video playback of HD and 3-D content, and acceleration of popular productivity applications." "We are excited by today's announcement, which marks a significant milestone for ARM and the ARM Partnership, and we look forward to working with Microsoft on the next generation of Windows. Windows combined with the scalability of the low-power ARM architecture, the market expertise of ARM silicon partners and the extensive SoC talent within the broad ARM ecosystem will enable innovative platforms to realize the future of computing, ultimately creating new market opportunities and delivering compelling products to consumers." "Even conservative predictions show billions of devices coming online in the next few years. One need only look at the creation and rapid growth of the netbook category to grasp what an Intel and Microsoft combination can deliver. While still in the future, what is so exciting is how our two companies will be able to match a tailored, low-powered Windows operating system with future generations of our popular Intel® Atom™ processors to deliver unique, PC-like experiences that offer the best battery life, performance and security around." "Windows on ARM represents a seismic shift for the computing industry. ARM is already the largest and fastest-growing CPU architecture in the world, and today's major news of Windows will only accelerate its adoption. We look forward to working with Microsoft to create amazing new computing devices with Windows." "Today signals a significant step forward for the future of computing. We at Qualcomm are excited about continuing our relationship with Microsoft to extend the reach of Windows to more Snapdragon-powered devices, offering high-performance mobile solutions with always-on connectivity." President, Qualcomm Innovation Center Inc.
"Texas Instruments (TI) is pleased to collaborate with Microsoft to make Windows on mobile devices a reality. TI has long believed that low power is the fundamental of fundamentals when it comes to mobility, and we look forward to taking our popular OMAP™ platform, with the ideal balance of high performance and low power, into exciting new mobile computing devices."